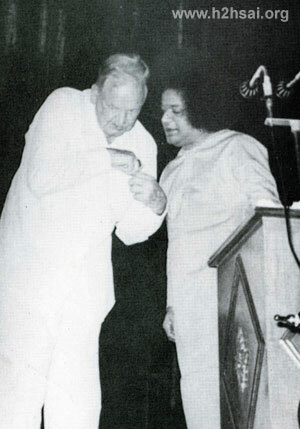 Heart2Heart started in August 2003 with the divine blessings of Bhagavan Baba with the sole mission of disseminating the spiritual message of Universal Love and Selfless Service to all mankind. We thoughtfully chose to begin an e-journal and not a print journal because of several reasons, principal among them being the reach. Seven years down the line, today there are thousands of dedicated readers of this spiritual journal from all corners of the globe. While we are glad about this, we are aware of the limitations of our endeavour too as we have this e-journal only in English. Yes, we have a few issues in German, Russian and a couple of them in Hindi but none of them are regular and are far from the way we would want them to be in content as well as design quality and periodicity. Unfortunately, that is what we have been able to offer in the past with the limited support we received in those languages. However, now we are more emboldened than ever because of the spirited initiative of Mr. Leonardo Gutter to start a Spanish version of Heart2Heart. We understand there is a dedicated team working on this and there is absolute commitment to ensure that we can offer this service at regular intervals. This has really gladdened our hearts as presently Spanish is the most spoken language in the world after Mandarin and English. 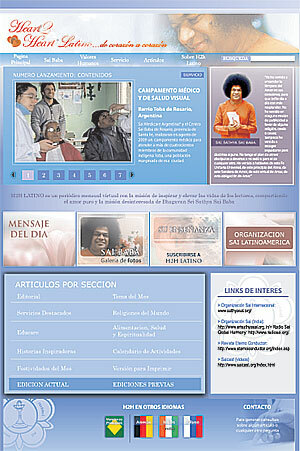 We hope through this new website h2hlatino.com [to be launched shortly] many more would be touched by the Pure Love of Bhagavan Baba and will strive to lead their lives based on Truth, Righteousness and Love. On the request of Mr. Gutter, Prof. Venkataraman penned an introductory article for the first issue of Spanish Heart2Heart, which is presented below for you as well. This is a powerful and pertinent piece awakening us to the real problems of current society and delineating the surest way to solve them as well. Since this article is quite elaborate, we have split it into three parts and added useful illustrations to help you understand the concepts better. We hope you will find this feature quite engaging and enlightening. Loving Sai Ram and greetings from Prashanti Nilayam. I feel particularly happy and privileged to offer this little contribution for the inaugural issue of H2H in Spanish. I not only congratulate all concerned for taking this worthy and commendable step, but also note with great pleasure that in fact, you in Latin America were not only the first to take advantage of Radio Sai but remain to this day, the only foreign language service that Radio Sai carries regularly. Your enthusiasm for spreading the Message of the Lord does not surprise me in the least. In fact, as far back as May 1991, I happened to have a small chat with late Dr. Hislop during the Summer Course [held in Brindavan]. Dr. Hislop said to me then, “You know something? The Sai Movement is spreading fastest not in America where I live and have been trying so hard to make people aware of Sai. It is spreading much faster in Latin America.” I asked him why was that, considering that there was a natural language barrier. Hislop replied that while devotees try to spread the Message using spoken languages, Sai works silently using the language of Love, and that is why! Having been associated with H2H right from its inception, I am of course highly pleased that you are taking a path-breaking step by starting a regular Spanish edition. I presume you would be using a lot of material originally published in English from the edition we put out. I hope, however, that you would not restrict yourself to merely reproducing in Spanish what we offer in English. Actually, knowing Leonardo Gutter and John Behner quite well, I am sure you would do much more, generating original material, especially that which is directly relevant to your situation and experience. Assuming that would be the case, may I offer a few suggestions? Basically, your primary task should be to make your readers understand clearly what Swami’s teachings really mean. It is my experience that devotees often simply repeat sayings like, “LOVE ALL, SERVE ALL”, “HELP EVER, HURT NEVER”, “SERVICE TO MAN IS SERVICE TO GOD”, etc., WITHOUT properly understanding the deeper significance of what Swami actually means. Allow me therefore to make a few comments and offer a few suggestions in this respect. What I shall be doing is to try and link the true nature of the human Spirit with the diversity that we see in the Universe. On the face of it, these two things might not only seem different but also appear to have hardly any connection at all. The amazing thing is that there is not only a connection but one that is profound and fundamental; let me explain myself. One thing unique about a human being is that deep within each one of us, without exception I might add, there exists an entity called the “Spirit”. Even atheists talk of the human Spirit. They too say, like believers in God do, that it is the Spirit of adventure that made Columbus sail unknown seas and finally discover America. It is the same Spirit that made humans to fly, go to the Moon, go to the South Pole, etc. At a slightly higher level, human Spirit expresses itself through extra-ordinary creativity in many dimensions such as art, music, literature, science, and so on. There, most people stop in describing the capabilities of the Spirit. I would, however, go one step further and add that the highest dimension of the human Spirit gets revealed through noble virtues such as compassion, selfless and loving service, amazing forbearance, etc. Throughout history and in many lands, people exhibiting such qualities have actually lived and made a huge difference to humanity as a whole, setting inspiring example by their tireless service and matchless sacrifice. In this context, one cannot but remember such wonderful people as St. Francis, Father Damien, Mahatma Gandhi, and Mother Teresa, to name just a few. All these were just human beings like you and me, but they rose to great heights by invoking the Divinity latent in them. Of course, such people do not emerge purely by accident; they do so entirely by the Grace of God, which all of us can earn, if only we decide to, and are determined to strive for it. All this is no doubt well known, but what most people do not appreciate is the greatness and the profundity of this entity that I have been referring to as the “Spirit”. Perhaps that term confuses you, in which case we might as well use the equivalent term, the Soul. If you do that, then it becomes easier for you to appreciate that virtues also spring from the Spirit, and do so when the Spirit so-called becomes elevated to the highest level. At this stage, a difficulty might arise. When one talks merely of the “Spirit”, people readily accept that concept. In doing so, however, they mistakenly believe that the Spirit in different people is different. That of course is NOT true, and that is the first thing we must learn from Swami. This is an extremely important point and to appreciate it fully, we must pay careful attention to Swami’s teachings. NO, OF COURSE NOT! Remember that what you call the Spirit is the Soul. There is only one Soul in all, and that Soul is nothing but God. In fact, all of you are nothing but God! IT IS SIMPLE REALLY, SINCE THERE IS ONLY ONE GOD, WHO IS THE SAME FOR ALL! Atma is another word for God, and that is why I sometimes address you as the embodiments of the Divine Atma. That is what Swami effectively tells us all the time. However, we all get totally confused, start shaking our heads, and slip back into merely quoting Swami without bothering to understand what He is saying. I am mentioning all this because explaining those subtleties to your readers is where your work really lies. Soul is nothing but an aspect of God. Thus, God is actually within us! And Swami reminds us that the word Atma is just another name for God.When the Soul [within] is fully awakened, it expresses itself largely via Selfless Sacrifice and Limitless Compassion, both of which are really Manifestations of Pure Love [since God is Love and Love is God]. Everyone of us has a Soul, and this Soul is the core of our being. This Soul is very powerful, and when activated, it can make a person do amazing things. This thing called Soul is nothing but an aspect of God. Thus, God is actually within us! And Swami reminds us that the word Atma is just another name for God. When the Soul [within] is fully awakened, it expresses itself largely via Selfless Sacrifice and Limitless Compassion, both of which are really Manifestations of Pure Love [since God is Love and Love is God]. People are very different in their behaviour. At the same time, they are supposed to have the same Soul. How is this possible? If God resides in all, why is it that some people are so evil? How come there was a Hitler, and how come we have so many terrorists these days? These are very good questions and indeed represent the core questions. Swami has patiently answered them all, indeed many, many times. If only we spend some time and make an effort to understand what He has said, then half our job would be done. A lot of what I am now going to say is already available in the English version of H2H; therefore, I shall make my remarks here somewhat brief. Atma = God = Eternal Spirit = Universal Soul. 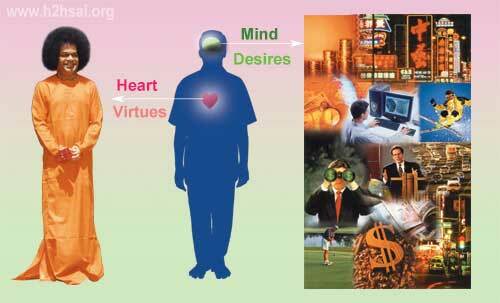 HUMAN BEING = BODY + MIND + ATMA. Am I the body? No, I am not the body; I am different from the body. Am I the Mind? No, I am not the Mind; the Mind is different from me. I am not the body, I am not the Mind; then who am I? 1. The Atma which is essentially God present as the Indweller. This is THE ESSENTIAL part of Swami’s Message and we need to pay very careful attention to it; if we understand it, then the rest is easy. Let us try to understand what Swami says by first asking where the three entities that make up a human being, namely the body, the Mind and the Atma come from. We all know where our body came from; from our parents. However, taking into account the fact that our body is actually made up of atoms [and remember when the body grows it simply means more and more atoms are being added to it, mainly via food, some via the water we drink and others via breathing]. What about the atoms? Where do they come from? From the Universe of course; in this way, the body of every human being on earth gets connected to the Physical Universe as a whole. Have you ever thought of that, namely that everything on earth, including you, me, dogs, cats, elephants, mountains, rivers, oceans, glaciers, are all made of atoms and all these atoms can trace their ancestry all the way to the Big Bang [that is supposed to mark the birth of our Universe]? Every single action of ours must breathe Pure Love, radiate Pure Love, and proclaim that the radiance of our actions really comes from our Beloved Swami who is the Real Source. That Swami is always in our Hearts. He is there all the time, 24/7, whether you are in Buenos Aires, or Bangalore or Beijing. All we have to do is to call out to Him with great earnestness. Next, we turn to the Atma in us. Some of you may be puzzled and ask: “The Atma is supposed to be Infinite and everywhere. How come then it can hide within a small human body?” This is a good question and the best way of understanding this is to look at the clouds in the sky. You will agree there are clouds not only over the place you live in but in other places also. Thus, if you live in Santiago, there might be clouds over that city; at the same time, there might be clouds over Puttaparthi also. All this is easy to understand. We now ask: “What is a cloud made up of?” And the answer is: “Clouds are made up of water vapour; in other words, clouds are just water vapour made visible.” Now the interesting thing is that there is water vapour everywhere in the atmosphere, even in places where no clouds are seen! In other words, while there is water vapour everywhere in the atmosphere, it is visible only in some places as clouds. This example gives us a way of understanding how the Atma can be everywhere and also inside each one of us. Just as the water vapour is everywhere and also in the clouds, so also the Atma is everywhere and also inside us. 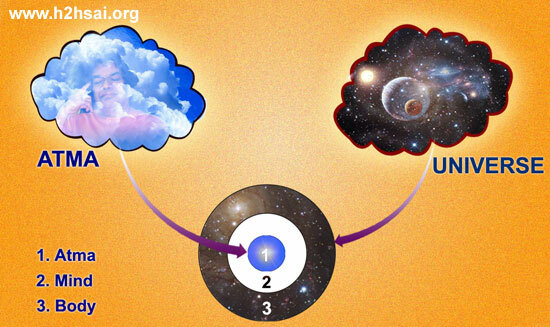 In other words, just as a particular cloud has only a portion of the water vapour that exists in the whole of the atmosphere, so also, we have a “portion” of the Universal and all-pervading Atma within us. with the words: “Embodiments of the Divine Atma”. 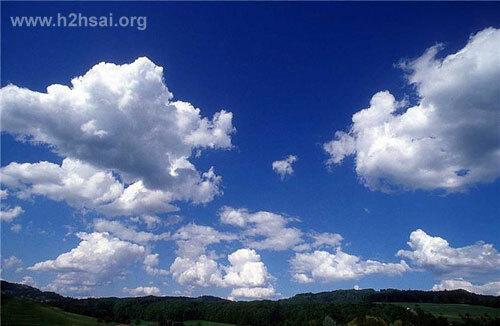 What we see in the picture above is blue sky with white clouds in several places. Clouds are formed due to the water vapour present in the atmosphere. Note, however, that water vapour is present THROUGHOUT the atmosphere, including places where the sky appears empty and blue. In the same way, Atma is present everywhere, including in all entities in creation. Thus, “a piece” of the Atma is in each of us. Just as the different clouds have different appearances, human also are different from each other in many ways. Nevertheless, One UNIVERSE ATMA connects us all. Swami also looks for Unity in Diversity, and that is why He often says: Cows are many but milk is one; bulbs are many but current is one; jewels are many but gold is one, and so on.